Weather forecast with rain fall, wind speed and direction, temperature, humidity, pressure, time and date. Remote monitoring of multiple sensors with My AcuRite mobile app or on a web browser. Broadcast on Weather Underground. Download your weather station data to a computer in a data file. Residential weather stations that provide forecasts plus current temperature, humidity, pressure, time and date. Weather stations for home use that offer forecast with wind speed, temperature, humidity, pressure, time and date. Access your weather report from multiple rooms. With so many features and types of weather stations available, there are many aspects to consider to make an informed purchase decision. Your favorite weather app, weather websites, the TV news, etc. get their weather readings from the Automated Surface Observing System (ASOS), a national network of remote weather stations located at regional airports. However, weather can vary significantly over even a short distance. Since most of us live 30 miles or more away from the nearest airport, that can explain why you sometimes see sunny skies on your weather app, but rain right outside your window. If you want a weather update specific to your exact location, nothing beats having a personal weather station in your back yard. Many outdoor hobbies and interests, such as gardening and golf, can be impacted by the weather. Businesses such as marinas, construction companies, and ski resorts can also be greatly affected by weather conditions. Having a comprehensive understanding of weather conditions at your location can have a significant impact on scheduling your day, saving money, staying safe, and more. A weather station can give you important insights into environmental conditions that could impact your home and family. It’s nice to know when to grab an umbrella or put sweaters on the kids before sending them to school. You could also set up alerts to notify you when conditions exceed your present ranges, so you can determine if you need to protect your flower bed from frost or pull the patio furniture indoors to protect it from high winds. With your personal weather station, you can easily view weather conditions at your home to make better decisions throughout the day. More and more people are discovering the excitement of being their neighborhood weather expert. They love watching trends, comparing the current weather to past seasons, predicting what the weather might do, or simply watching the wind and rainfall readings during a storm. Having a personal weather station offers a gateway to a fun and fulfilling hobby, and people truly enjoy checking in on conditions throughout their day. What’s the right personal weather station for you? The answer depends on your needs. If you’re just looking to glance at conditions before heading out the door, a basic weather station would be sufficient. But, if your weather tracking requirements stem from a special hobby, interest, or professional occupation, you could benefit from a weather monitoring system with more advanced capabilities. Weather stations provide valuable information for activities like gardening, hunting and fishing, golf course management, construction, sailing, property management, agriculture, softball/baseball, parenting/child care, and more. But to enhance activities like these, the system may need to offer additional weather sensors, such as a rain gauge, wind speed meter, or lightning detector. There are also weather stations that allow you to view your local weather conditions on-the-go with an online weather app. With My AcuRite remote monitoring software, your weather station data is viewable on a smartphone, tablet, and on a computer using a web browser. Another feature to consider is whether you would like to export and analyze your weather history. This is especially beneficial for activities like farming, school and park district maintenance departments, or storm chasing and storm spotting. With My AcuRite, you can view historical data and more. AcuRite’s current flagship weather monitoring system gives you a complete picture of your outdoor conditions. Easily installed in your yard, our exclusive 5-in-1 weather sensor measures temperature, humidity, rainfall, plus wind speed and wind direction. The indoor digital display also measures barometric pressure, indoor temperature, and indoor humidity. A 5-in-1 system provides useful environmental information including current conditions, highs and lows, if conditions are trending up, or down, or holding steady, wind chill, dew point, heat index, and a reliable weather forecast specific to your exact location. To get an even bigger picture of your local weather conditions, you could get a weather station with lightning detection. Requiring the use of AcuRite’s lightning detection-enabled displays, it can provide advanced warning of lightning activity up to 25 miles away, which is a beneficial since our eyes and ears can only see/hear lightning up to 10 miles away. The system senses cloud-to-ground, cloud-to-cloud, and intra-cloud strikes, plus offers a strike counter and an estimated distance to the strike. The lightning detector information could be vital in helping you get your loved ones to safety when severe weather approaches. Adding an AcuRite Access to your weather station lets you harness the power of the My AcuRite weather and indoor environment monitoring platform for app and web browser. This lets you view vital weather readings on your computer, tablet, and smartphone as more and more, we turn to our mobile devices for valuable information throughout the day. You can also export and analyze weather history data, and set email and text message alerts for when conditions change and may require your attention. My AcuRite also lets you view intuitive graphs and trend charts. In addition to that, the AcuRite Access can receive data from any combination of up to 7 AcuRite weather sensors and indoor environment monitoring sensors. This gives you near limitless expandability and options for customization. AcuRite’s PC connect systems have long been popular with serious weather enthusiasts. 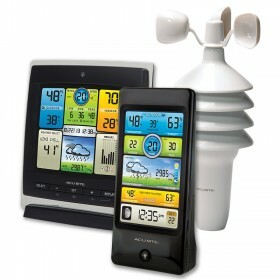 Thanks to a standard USB connection, it’s easy to connect your AcuRite 5-in-1 PC Connect weather station display with a Windows PC computer. From there you can export historical data into a spreadsheet to analyze trends and compare totals to data from previous months and years. And, provided the computer is on and connected to the Internet, PC connect also allows you to stream your weather station data to web browsers and mobile devices through the My AcuRite platform. You can also share data with weather communities like Weather Underground. If you simply want to know when to pack an umbrella or put sweaters on the kids before sending them to school, a basic weather forecaster will be your trusted friend every morning. It gives you essential weather information including temperature, humidity, barometric pressure, trends, and local weather forecasts. Simply place the easy-to-read display on a night stand, end table, or on your kitchen counter, and conveniently receive all the weather information you need to plan your day with confidence. Bridging the gap between AcuRite’s basic weather stations and our full-featured 5-in-1 weather monitoring systems, the 3-in-1 provides dependable tracking of temperature, humidity, barometric pressure, and wind speed. Nice for runners, cyclists, and other outdoor enthusiasts, it helps you know what to expect when you head outside. Another great thing about AcuRite weather stations is that many can be expanded and/or upgraded. Would you like to view your weather station data in multiple rooms of the house? Want to see your weather data on your favorite mobile device? Want to stay aware of when lightning is near? Are you also interested in monitoring indoor environments like your home, crawl space, greenhouse, or perhaps check for water leaks? AcuRite sensors can provide data for all those situations and more. As your needs evolve, simply adding sensors, displays, or an AcuRite Access can provide even more benefits. If your weather station display is located in your living room but you’d also like to view data in your bedroom and/or office, the solution is simple; add more displays. AcuRite sensors transmit data up to 330 feet (100 meters) and the information can be viewed on multiple displays throughout your home. 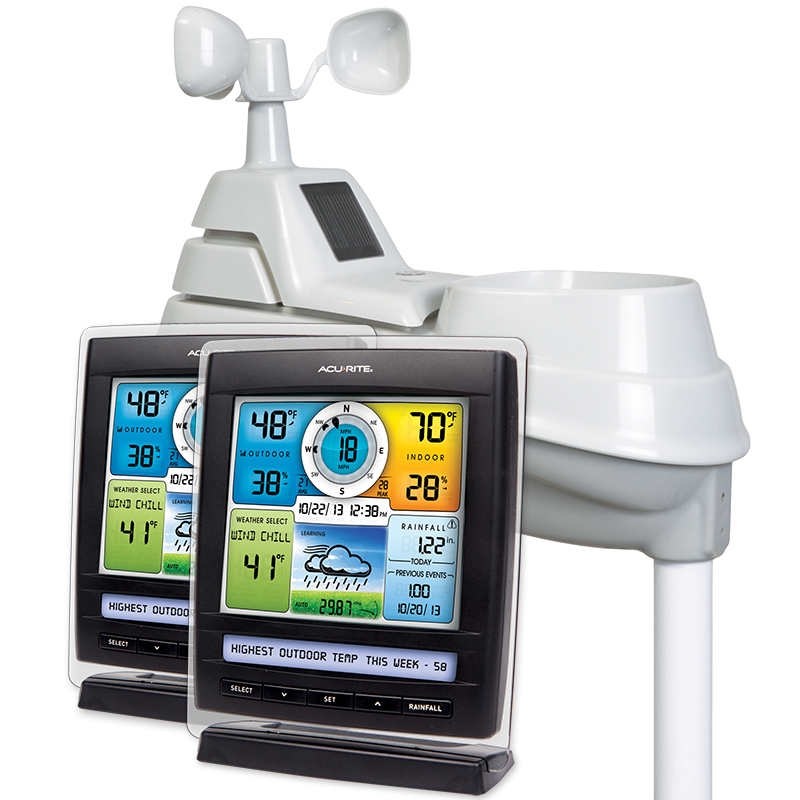 Why Choose AcuRite for Your Weather Station? Customer Service—We often hear that our industry-leading consumer support team stands head and shoulders above the competition. Whether you need help with setup, troubleshooting, or ideas on how to enhance your system, our staff of friendly, knowledgeable experts provided the help you deserve and expect. Breadth of Line—Regardless if you seek a basic weather forecaster or a professional weather station with My AcuRite, we offer the quality, features, accuracy, and support. Ease of Use—Many professional weather stations offer quality and performance, but it can feel like you need an engineering degree to set them up and use them. From our near tool-free installation, all-in-one designs, seamless setup, and intuitive interfaces, AcuRite pro weather stations offer top-level performance in a user-friendly package. Modern Platform—AcuRite remote weather stations offer a cutting-edge mobile platform and app-based interface that is designed to adapt to your evolving needs. Value—Durability, accuracy, support, and longevity don’t need to break the bank. We offer professional weather stations at affordable prices.